While many companies are eager to embrace ‘disruptive’ technologies, few are equipped to implement them in a meaningful way. Enter Denise Goldsworthy who, after a long career as an engineer, now advises companies on incorporating truly disruptive technology. Denise Goldsworthy started as a metallurgist at BHP Steel in Newcastle before moving to Rio Tinto in Western Australia, where she swiftly rose to senior management roles. After a stint as Chief Commercial Officer on Rio’s autonomous trucks project, she founded Alternate Futures, a company providing advice to business on innovation and disruptive technology. create: Can you start by defining disruptive technologies from your point of view? DENISE GOLDSWORTHY: When we formally try to define disruptive technology we normally use the definition of Clayton Christensen from the Harvard Business School. He talks about a new emerging technology that unexpectedly displaces an established one. But I find there is a lot of common use of the phrase ‘disruptive technology’ and I think a lot of people are using it more broadly than is intended. So when I talk about disruptive technologies, I’m looking for things that are going to be major step changes, order of magnitude improvement. The sort of thing that’s going to trigger a reaction like: ‘Wow, I never thought that was possible!’. To me, that’s probably the best way to describe a disruptive technology. create: Can you give an example? DG: I think there are a couple of things that are going to have a big disruption to engineering in the near future. The biggest is the creation of new materials. Where the huge changes are happening are actually in the production of composites. People are putting together stuff at atomic level and delivering unimagined material properties. It fundamentally changes what can be done and therefore it’s going to ultimately change every industry. This is why I think the composites are just a classic example of disruptive technology. People used to say, the world might ultimately need, whatever it was, 10 computers, which we now all laugh at. Or why would anybody want to have a car when horses are more flexible? With the benefit of hindsight, you can say, everybody was stupid at that point and couldn’t see the wonderful changes that could come through from those sorts of technologies, especially computing. I think that what’s going on with composites (and a lot of this is actually happening in Australia) is just going to change so much. The rest of engineering needs to understand that. create: Are engineers slow to embrace these technologies? DG: There are some engineers who are. I think the problem is the broader business environment that a lot of engineers find themselves in where everybody is conservative, risk averse. You need to comply with this and, frankly, the scientific literacy of non-scientists or non-engineers seems to be deteriorating. It’s something that Australia is trying to collectively grab hold of; how do we improve the level of STEM understanding as kids go through high school and then into the university system? create: That’s interesting, because the number of people studying these subjects is declining. Will that change once people realise these are the skills they are going to need into the future? DG: It is interesting. I’m a fellow of the Australian Academy of Technological Sciences and Engineering (ATSE). You get into academy discussions with university vice chancellors and deputy vice chancellors and, as individuals, they all go on about the need for compulsory science and maths through to year 12, that they should be upping the entry requirements and standards of science and maths into the engineering disciplines so that the engineers of the future are what the world needs. The other side of the equation is the financial viability of the schools and university systems. We’ve got many people working on how we can make it easier to get more students in. The default position that too many people are going to choose is you lower the standards and you don’t give them the hard subjects, like science and maths in high school, then we’ll get more people who go to university and won’t that be great? But if they’re not studying the right stuff, it’s actually not good for the world. We need to have more and more people taking on the hard stuff. It goes back to the quality of the teaching of science and maths back at high school, but also the passion for science and engineering in those people. They are spending so much time with our children and teenagers and they are a large part of creating that passion for the future. 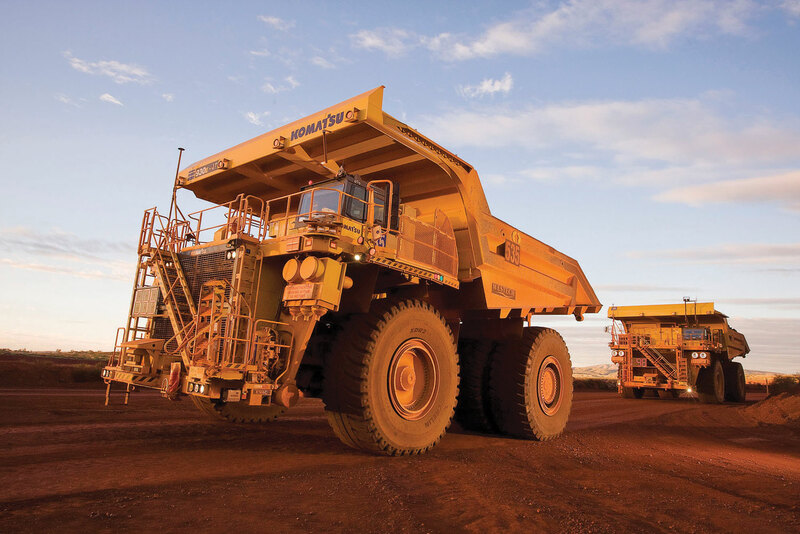 create: Can you tell us a bit about the autonomous trucks project at Rio Tinto from the point of view of how disruptive it was, and how you approached the issues that you had to face there? The autonomous truck project required Rio Tinto and Komatsu to get a better understanding of what the other did. DG: I was looking after the global commercial negotiation. My role came about because, prior to me getting involved, the company had been dealing with it as a wonderful engineering project. There is only so far you can get if you just look at the engineering aspects. There’s a whole lot of business things that were missing, not just the obvious stuff around commercial terms and intellectual property, but fundamental questions around, how do you continuously improve this? Or the cultural questions around who are the stakeholders, more broadly. It is broader than the truck drivers on the mine that you’re at. It goes through to government regulators. You’ve got kids in high school who are currently thinking that, ‘I don’t have to do well at school, because I’ll just go and get a highly paid truck driving job up in the Pilbara.’ Well, guess what, they’re not going to be there! So there are lots of indirect stakeholders around the place. A lot of problems came about because people hadn’t thought through all the consequences of that. In terms of flagging a different model as a comparison, if you look at what the car manufacturers are currently doing around their vision of developing autonomous cars. They are working together in a collective around common engineering standards, common infrastructure requirements. How do you work with the regulators? How do you develop the trust of the customers? How do you do it in small steps so that you can bring along the majority to give you the economics to make this feasible? And not just win over a few techno nerds who want to have the latest fancy cars. Because they’re collectively working on those very complex problems, they are moving forward. Our cars are becoming more autonomous around us, whether we know it or not. We can work out, what infrastructure do we need to have? What does this mean for bridges, roads? What does this mean for legislation I need to have? It’s being done for a communal good. At the heart of the autonomous trucks problem was that everybody was so worried about, ‘I need to protect the commercial value for myself.’ It didn’t matter which party you were talking to, whether it was Rio or their competitors, Komatsu or Komatsu’s competitors. Everybody was in there arguing over “my fair share of the pie”, but they’re actually destroying the pie. Whereas the whole thinking with the cars is, how do you build the pie? If we all build lots of pies, then we all get lots of money, then it doesn’t matter quite as much how big the share is. create: There seems to be a disconnect between people who want 100 per cent autonomous cars and the people who want autonomous cars and driven cars on the road at the same time. Is that the same sort of thing? Trying to work out the difference between what’s the ideal solution from an engineering point of view, and people who have their own little agendas as well. DG: It’s a matter of putting the engineering solution aside for a few minutes to think about what the fundamental needs are that people are trying to address. Is it a matter of reducing fatalities on the road, is it a matter of reducing the cost of transport, reducing the time it takes for people to get from A to B? But then, people also have needs about, ‘I like driving a car because I like to have a buzz,’ or, ‘I want to go four-wheel drive because it challenges me to do something about it’. Jumping to conclusions around what autonomous cars should look like is not helpful. It’s a matter of how do you work in each of the pieces so that you can potentially meet all the needs? If you take it in smaller chunks. There are things that are happening with cars at the moment around anti-collision systems that automatically cut in so you don’t run into the car in front of you. There’s a lot of cars that will do parallel parking for you and all of that stuff. Pieces can deliver the needs that people are looking for without having the whole end goal totally defined. When you look at it piece-by-piece, it redefines where the end goal could be. People become comfortable with certain things. This stuff does evolve and I suppose it’s one of the realities of technology, this solution is not an instantaneous process. create: Going back to the trucks, what was the biggest lesson that you learnt on that project? DG: I think there were probably two. The first one was, to get a truly disruptive innovation, you need to have total trust across the range of people who cover the deep understanding of the problem and the deep understanding of the solution. It was very interesting when we were trying to get down to resolving some very specific issues that exposed how little Rio understood about manufacturing trucks, for example. And how little Komatsu understood about operating a mine. Now they share a very good understanding of both. That’s very different. It’s required to create a disruptive solution. I think the second key in there is that you have got to be active with your risk management and stakeholder management, at every step of the process. And the risks and stakeholders change at every step and you need to have some understanding of what sort of risks and stakeholders are potentially going to be involved five or 10 steps down the track. Because it may actually change what you do in the current step. create: Are there particular areas where you think businesses are being affected by disruptive technologies more than others? DG: People should be thinking about disruptive technology as a positive opportunity around how they can move forward. I think the biggest piece that’s currently missing at the moment is the leading edge applications of sensing and data analytics. We all take advantage of the latest technology on our latest mobile phones and all of these things coming through, but the revolutions that’s happening is in computing and also in mathematics. I describe it as splitting the task of finding a needle in a haystack into two steps. You need to have your maths and IT guys and maybe even a physicist developing a load of sensors, working out how do you find an anomaly in your haystack? Where is the opportunity? Where is something different going on when they assist? Then you have your engineers and your scientists who interpret the anomaly to work out whether it’s a needle or not. If you can split that task into two then there’s a lot more that we can collectively do faster; but at the moment business is largely ignoring the data analytics. create: Is that where you come in? DG: That’s part of the reason why I created Alternate Futures, to work in that gap, to try and make the connections so people can see that this stuff is possible. I’ll give you one example. The operations research mathematicians at Curtin University have been doing some wonderful stuff over the past couple of years that have reduced the time of doing engineering tasks by a third; just by analysing the problem from a mathematical perspective. Now turning an engineering task into maths these guys could play with, required the engineers to actually sit down and explain what the problem was. The mathematicians then did their wonderful things. It then had to be interpreted back into how the engineers use it. The stuff that Curtin is doing can ultimately lead to hundreds of millions and potentially billions of dollars of savings into the major industries in Australia, but the way it was created was by having these engineers working together with the mathematicians, neither group could do it themselves. create: I’ve heard people say their best ideas come when chatting to people outside their teams during lunch breaks. Do we need to encourage more interaction? DG: We’re working with one of the leading engineering schools at the moment. One of the interesting things that came out of that was a few years ago, as they were expanding, the lunch room was eliminated to put in some more classrooms and offices. Everybody talks about how the level of interaction, the level of innovative thinking, how significant the drop off has been since they removed that place where people just threw ideas around in a random way, at a random point in time, and that it just created great ideas. Do underground cities offer a solution to the world’s urban boom?